An intriguing range of fresh pesto and salsas will next week flaunt their flavours on the shelves of Tesco stores across London when Scotherbs, fresh herb producer for the the whole of the UK, launches its dynamic Ariba range to add passion to the palates of Londoners. This new grocery eye-catcher, Ariba, offers a range of fresh pesto and salsas and is, quite literally, a taste explosion that answers the pleas from food lovers for a tasty and convenient accompaniment to any meal. The Ariba range includes: Fresh Basil & Pine Nut Pesto, Rocket & Cashew Nut Pesto, Mango & Coriander Salsa and Salsa Verde. All pestos and salsas are specially created to complement chicken, fish, pasta, and many other meals offering a tantalising treat for the taste buds. They are perfect for livening up the BBQ or summer salads. The colourful packaging reflects the vibrant taste captured by Scotherbs, a company passionate about food. Fiona Lamotte, Managing Director at Scotherbs, who has developed the product, commented: "This is a really exciting development for the company. We have introduced fresh herbs to homes nationwide over the past ten years, and this is the next stage of development - making fresh, delicious sauces for real food lovers to enjoy. 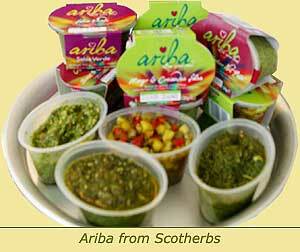 The Ariba range of ready made pestos and salsas is the result of Scotherbs passion for herbs, and good food". "Developing the range has been exciting and the market is now ready for that burst of flavour that we've concocted in the Ariba range. We are delighted to see the product now being distributed in London where we hope the discerning palate of the consumers will help to build the demand which will take the product around the country". As well as Tesco stores in and around London, Ariba is currently sold in Harvey Nichols and specialised delicatessens the length and breadth of the country. Founder of Scotherbs Robert Wilson discovered that he could not buy fresh herbs readily in the shops to cook for his family, he began growing and supplying fresh culinary herbs to the catering trade and garden pot trade. That was seventeen years ago and the company now produces herbs, salad leaf and edible flowers for Tesco stores across the UK. This is a huge success story for a very small company starting out and now in the homes of millions of Tesco shoppers around the country. It all began in the picturesque walled garden in the Carse of Gowrie where Robert Wilson began growing fresh herbs for the family, but quickly realised that there was a demand for fresh herbs. In 1987 Scotherbs was born. The company is now the largest supplier and grower of fresh culinary herbs in Scotland, and takes pride in supplying a first class product and an excellent customer service. An extensive variety of fresh herbs, salad leaf and edible flowers are grown where possible in Scotland. However, during the winter months, herbs are sourced from abroad from selected growers with the same high standards applied as imposed in Longforgan. Robert has set up a company called 'Ensaladas de Canarias' in Tenerife, an area with year round sunshine, for continuity of supply. Herbs are harvested early morning and flown same day to Scotland for optimum freshness and quality. Crops are grown to strict quality assurance standards. The company has HACCP, COSHH and Assured Produce Procedures in place and are BRC accredited, essential standards for safe food production today. The Carse of Gowrie is an ideal area in which to grow herbs and salad leaf. Every year sees an increase in local home grown product. Fiona, Robert's daughter who currently runs the operational end of Scotherbs, believes that in the past ten years people have become much more open to trying herb products and that there is still potential to increase sales. Although not organic, Scotherbs grows under strict controls. Herbs are strangely more regulated than other vegetable crops, although people probably eat less herbs than other crops. Scotherbs continue to grow herbs, salad leaf and edible flowers from April to October. Ariba can be used for the following delicious recipes. Put couscous in a pot and add boiling water and stock - give a stir, cover and leave on a very low heat. Take off heat and allow to stand for 5 minutes. Check all liquid has been absorbed. Stir through Ariba Fresh Salsa, the chicken (if adding), and season. Let stand for a further 20 minutes to let flavours develop. Great side dish with pork or lamb! In a large saucepan boil potatoes until soft. Drain and mash potatoes, adding milk, butter and Salsa Verde. Using an ice cream scoop or tablespoon form little balls. Heat oil in a frying pan and put the potato nibblers in to brown and slightly crisp. A delicious and slightly more adventurous recipe for potatoes. For posh fish and chips! 2 tbsp Ariba Fresh Rocket and Cashew Pesto. Lay the lemon slices on a baking tray and drizzle the oil over them. Position the two Swordfish steaks on top and evenly spread the pesto over the tops. Place the tray in the oven and bake for about 20 - 25 minutes until the fish is cooked thoroughly. Serve with baked oven wedges and you have a posh Fish & Chips Supper! Rich and full of flavour! Sauté your onion and leek with the olive oil in a large pot on medium heat for five minutes. Once softened add tomatoes, thyme, stock and tomato stock and wine and vinegar. Let simmer for 15 - 20 minutes. Sieve out any tomato peels, add sugar and seasoning and puree until smooth. Stir the fresh pesto through the soup. To serve scatter parmesan shavings generously.